As a Swedish fur trade enthusiast I have always been looking for Swedish participants in the Rocky Mountain fur trade. I can’t say Swedes played any major part in the mountain trade as I have only encountered one. This article reveals a part of his story. Later on Ruxton describes a scene at rendezvous where ”...A Swede and an "old Virginian" puffed together." (Ruxton p. 106). Although not stated, this Swede was probably Cross Eagle as well. "’There is Crosseagle, who is thinking of the Rhine all the time, or singing about it, though he never saw it, as it does not run through Brandenberg’, said old Bill. ‘Well, and you never saw the Delaware,’ said the German. Based on Stewart’s description, Cross Eagle might very well have been German or Austrian instead of Swedish. The third classic book that mentions Cross Eagle is that of Rufus Sage. In his Scenes in the Rocky Mountains he gives almost the same story as Ruxton, but also adds some valuable geographic information. Apparently Sage met three trappers; Cross Eagle, Wheeler a Virginian, and an unnamed Frenchman at Fort Platte 1841(Sage p.125). He also claims that …Cross eagle, was a Swede… (Sage p.126). Both Sage and Ruxton tells the story of Cross Eagle’s heroic death with only details separating the stories (Ruxton p. 147-148 and Sage p. 125-126). I’ll return to that tragic event. A clue to Cross Eagle’s true identity can be found in Allan Kastrup’s book titled The Swedish Heritage in America from 1975. Without naming the source he states that “ A Swede, who acquired an Indian wife and became known as Cross Eagle, is said to have lived in Colorado in the 1830s and perhaps even earlier. According to local legends and reports he was a Swedish nobleman, Hjalmar Adlercreutz, whose German sounding family name actually means ”eagle cross” (Kastrup p.476). This might be the explanation to Stewarts assumption that he was a German. A possible source to Karstrup’s statement is a German book with a Swedish version titled Skildringar från Amerika: hemtade ur berömda resebeskrifningar (English translation: Depictions from America; taken from famous travel describtions) published by P. G. Berg in Stockholm 1860. It was originally written by a German named Hermann Kletke. 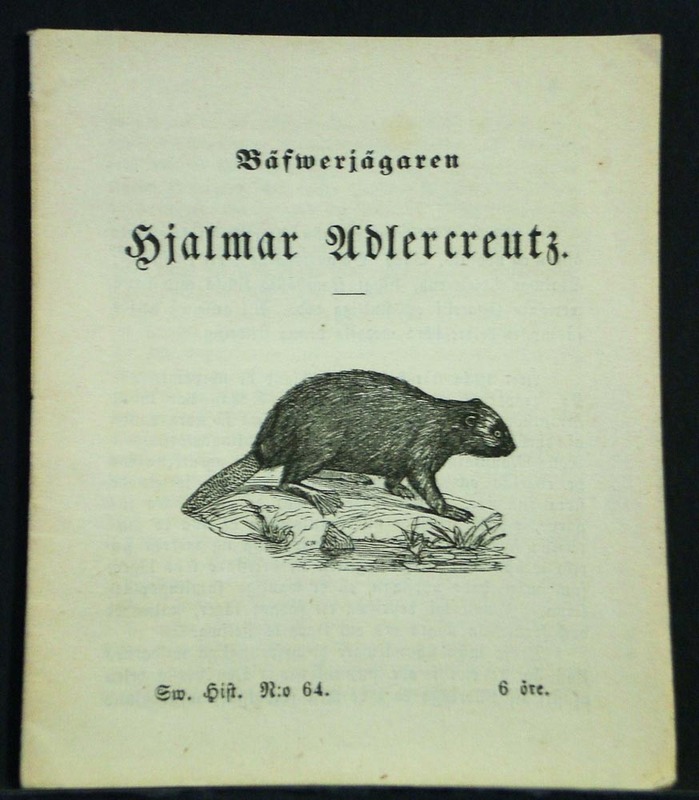 This book contains a chapted named Bäwferjägaren Hjalmar Adlercreutz in Swedish or Die Biberjäger in Kletkes original, where the Swedish title translates to The beaver hunter Hjalmar Adlercreutz which P. G. Berg also published as a separate booklet in 1872. To make it even more complicated Kletke in his turn borrowed the stories from other sources. He claims the source used for Die Biberjäger was a Danish newspaper named Flyveposten published between 1845 and 1870 (Kletke “Vorwort”) now accessible on microfilm in Copenhagen. The booklet is more or less a reprint of choice parts from Ruxton’s Life in the Far West, except it contains a very interesting addition describing the Swedish trapper Hjalmar Adlercreutz. It appears as the original unknown author based Adlercreutz story on an interview with none other than Christoffer Houston ”Kit” Carson. The interview took place in St. Louis while Carson was preparing to guide one of Fremont’s famous expeditions (1845?). [p. 13] I mentioned above an old Swede, that was playing cards with a Virginian at the earlier mentioned rendezvous. It was a man past fifty years of age, which had already spent more than thirty years in in the Rocky Mountains and among the Indians. Tall, strong and muscular with an almost mummified, by sun and mountain winds, yellowish furrowed face. Still he showed clear evidence of his Scandinavian descent by his fine blue eyes and his rich blonde hair, which hung down over his shoulders without age giving it a tint of silver. None of his comrades knew the story of his early life. He went by the name “the Old Swede”, although he didn’t like it. Kit Carson, that is famous across North America, as the bravest and most persistent mountaineer (mountain inhabitant, but in this case a guide in the western, still unknown parts of the United States), told me (writes the author of this sketch) many things about this old Swedish man during my visit to Saint Louis, where I met him several times while he waited for Colonel Fremont, to accompany him [p.14] on a journey, that almost killed it’s participants. He had already, serving as guide, followed Fremont on all of his scientific excursions and surveys in the Rocky Mountains, along the Great Salt Lake, and through California and Oregon. During this expedition Fremont, Kit Carson and ten of their company safely crossed the Rocky Mountains, the remainder of the party (around thirty men) died in 1847 during a blizzard, and a hundred mules and the same amount of horses along with them. George Ruxton, an English writer and friend, that also spent a part of his life in the western states and published the beginning of an interesting work covering the wild life in these parts, also mentioned this Scandinavian, who’s memory surely will live on among the beaver hunters, and who’s hunting adventures will be told from kin to kin, when these hardy men during a cold fall or spring evening, camp in the dark desolate mountain passes and smoke their pipes around the flaming log fire. Kit Carson wrote his name down, but couldn’t pronounce it. His name was Hjalmar Adlercreutz. To only one of his trusted friends did he tell, that he descended from an old noble Swedish family. For what reason he became a beaver hunter, why he came to America and what he previously had done no one managed him to tell. You never saw him laugh, not even at the most ridiculous scene. He never used alcohol, with the exception of one yearly event – the rendezvous – [p.15] where we as mentioned above, meet him - and even then he used the beverage with moderation. However he was addicted, like all of the beaver hunters, to gambling. He had in person told Kit Carson, that he during his last twenty years in the mountains had earned more than 15 000 dollars on beaver hides. Every year he had decided to return to Saint Louis, and there end his days. For this reason he had sold his hides for shiny coins, but fourteen days stay at rendezvous always “wiped him clean”, so that he after a number of years didn’t even have enough credit to obtain the necessary equipment as the hunting season closed in. Many stories tell of his courage, his persistence, and his presence of mind, and his death is, as Ruxton Tells it, just as characteristic. Adlercreutz, was on an excursion accompanied by other trappers, when they one morning was attacked in camp by numerous Indians, that true to their habits ambushed the hunters and now conducted a huge blood bath among them. Adlercreutz was badly wounded, but still had his rifle, powder horn and bullet pouch, Close to where they had camped stood a hollow tree. At wind speed he hurried to the tree and crawled in to the hollow. From there he defended himself from the savages for most of the day with major persistence and cold-bloodedness. He killed five Indians and wounded several others. When the redskins couldn’t drive the brave beaver hunter from his [p.16] fortification, they used the favorable wind and set fire to the tall dry grass that surrounded the tree. Soon the dry trunk ignited, and Adlercreutz was forced to leave his hideout. He grasped the barrel of his rifle, and ran and swung his rifle stock into the crowd of Indians and finally fell, pierced by innumerable arrows, but not until he brought two more of his enemy to the ground by the force of his hand. Later some of his companions found his dead body. His head was scalped, but the same seriousness, which his face always expressed during life, proved unchanged even in death. They buried him at this place, where he fell, and in a dark gloomy mountain pass, where a white man might never set his foot again, the uneducated hunters after their custom raised a simple wooden cross that by now for sure has rotted away since long. There is indeed a noble Swedish kin named Adlercreutz. It originates in Finland (Sweden at the time) where a Tomas Teuterström (1643-1710) was nobled Adlercreutz by the Swedish crown in 1700 (N:o 1386). In true Swedish tradition the family tree is well documented from Tomas to this date and disappointing enough, there is no Hjalmar there to confirm Kletkes and Kastrups claims that Cross Eagle was part of this family (Runeberg p. 18). The only Adlercreutz that left his prints in the new world during the period in question was Fredrik Thomas Adlercreutz (1793-1852). He spent parts of his life in Ecuador, Colombia and Venezuela where his relatives still remain. Perhaps Hjalmar was an illegitimate child, or perhaps Kletke’s source or Hjalmar himself made the story up. Perhaps the future will tell. In 1844 Hjalmar Adlercreutz was more than 50 years old and had spent his last 30 years in the west. In other words he was likely born in the late 1780’s or early 1790’s and headed west sometime close to 1814 (give or take a few years). During this time he frequently visited rendezvous and for some time was accompanied by an Arikara wife whom he bought for a Hawken rifle. Apparently Kit Carson wrote his name down (when and where unknown) but he couldn’t pronounce it and therefor called him “the Old Swede”. During his first twenty years in the mountains Adlercreutz managed to trap beaver valued to a total amount of $ 15000, all of which found its way back to “the company” on account of drinking and gambling at rendezvous. His death is described by both Ruxton, Sage (claiming them to be Sioux Indians) and Kletke resulting in his scalped corps. In this fight scene Ruxton calles him “Cross-Eagle” while Kletke (more or less quoting Ruxton) calls him Adlercreutz. An ongoing project - Help needed! There is still a lot of research to be done to confirm the connection between Cross Eagle and Hjalmar Adlercreutz and his involvement in the mountain trade. Perhaps fur trade records I don’t have access to can confirm his actual existence. Please let me know if you stumble upon anything that might help. ·Anrep, Gabriel: Svenska adelns ättar-taflor . Stockholm: P. A. Nordstedt & Söner, 1858. -Bäwferjägaren Hjalmar Adlercreutz. Stockholm: P. G. Berg, 1872. -Neue Reisebilder: Skizzen aus der Natur und dem Menschenleben: zur Belehrung und Unterhaltung für die reifere Jugend . Berlin: Julius Springer, 1855. ·Ruxton, George F.Life in the Far West. London: William Blackwood and Sons, 1849.